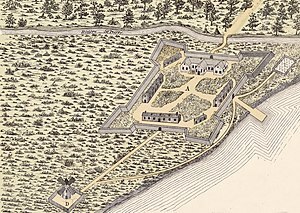 On November 13, 1689, the Iroquois massacred the settlement of La Chesnaye, 20 miles from Fort Ville-Marie (Montreal). Twenty people died. Roots Web by Wayne Jones. R.D. Garneau’s Quebec 1670 – 1689 Quebec Culture. Also interesting is found at Project Gutenberg in the book, The Fighting Governor a chronicle of Frontenac. I’m happy you like the site. Thanks!